Apparently RIPX was exactly what I needed to get reading. Who knew? Apparently I am SO in the mood for moody autumn books, I can hardly control myself. This past week I finished off a book (the first one for a month), and this weekend I sucked down another! I'm not really feeling the review vibe, so how about some minis? 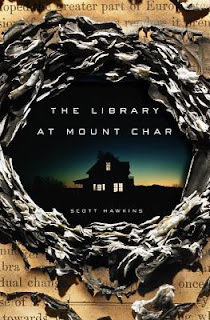 The Library at Mount Char, by Scott Hawkins, is a rip-roaring, freaky, gory time. There's this woman named Carolyn, and she's on a mission to find her father who can control time and space, call light from darkness, raise the dead. She's one of twelve of his adopted children who are "librarians," masters of their own catalogs of topics and abilities: resurrection, mathematics, languages, war, etc. But this is not some happy family. They're just as likely to kill and resurrect each other as they are to sit around and eat cinnamon rolls and toke. In searching for her father, Carolyn enlists the help of a long-lost friend, one stubborn war hero, and some very powerful animals. If her father is dead, who will inherit the library and all the power in the universe? This book is gritty and terrible in places. Lots of violence, lots of ruthless killing. But isn't that the way of gods? Demigods? They're not called that, and they seem to have their own unique mythology, but this story reads very much like a novel in that vein. Horror, urban fantasy, science fiction...it's all right here wrapped up in one really involving book. This novel felt "big"...in the way that many seemingly scattered plot points came together to make something grand. 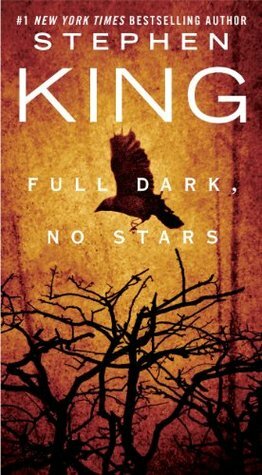 Full Dark, No Stars, by Stephen King, has been sitting on the shelf for years. I think I've dragged it out for a few RIP events now, but I finally got around to reading it, and I damn near read the whole thing in a day. This book consists of a fairly lengthy novella ("1922"), a couple of shorter novellas ("Big Driver" and "A Good Marriage") and two short stories ("Fair Extension" and "Under the Weather") the latter of which was a bonus story added to the paperback release. Of the lot, my favorites were "Big Driver," "A Good Marriage," and "Under the Weather," though all of the works kept me engrossed. Emphasis on the gross in parts. On the slasher scale, this collection is not the stuff of Stephen King classics like Pet Sematary or It. It falls more on the thriller side and thoroughly examines the lengths to which people are willing to go for self-preservation. In "Big Driver," a 40-something cozy mystery writer is captured, raped, and nearly killed after a flat tire leaves her stranded. Ultimately she has to decide how to put the issue to rest...by calling the police or taking her detective skills to a new level and the perpetrator's fate into her own hands. Likewise, when a suburban wife finds out her husband's terrible secret in "A Good Marriage," how does she live with herself? How does she make sure her husband comes to justice without ruining her children's lives? Big questions and big decisions for these characters, and they're not always good decisions, but they are highly entertaining quandaries. It sounds like you're gonna own R.I.P. X. I listened to A Good Marriage and liked it a lot. I hope so! Just loved "A Good Marriage." I bet it'd be a good listen, too. Did you know they made a movie of A Good Marriage? I think you can stream it if you have Netflix. 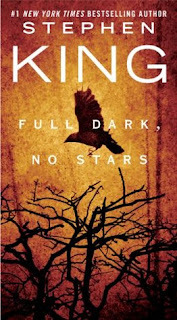 I really liked it but of course, nothing beats a King book. I didn't realize it until you mentioned it! I'll definitely check it out. I think Joan Allen was cast as the wife, and she'd be perfect for it. Hooray for RIP getting you back in the reading groove! Hooray indeed! So glad to have this boost! Hahah, yes it is! So so so unique and good weird. I hope you love it, Fence! Yesss! SO glad Mount Char ended up working so well for you! :D It's perfect for R.I.P. Definitely! I want to sing its crazy praises from the rooftops. I've been curious about Mount Char but...after hearing about the gore and violence I'm not sure anymore. I didn't know anything about the book except that it was DIFFERENT. Hmmm...Torn! Yeahhhh, the "librarian" of war is pretty...talented. Heads roll and whatnot. Although, Trish, you read Uncle Stevie all the time. You could totes handle Mount Char. Me too! Now if I can just keep it up. I'd forgotten just how great Stephen King is at building suspense. At putting normal people in some really CRAZY situations. Just loved it. Mount Char!! One of my fav reads of the year. I love SK. Firm believer in picking anything up by him and enjoying it. Yay, glad that your reading mojo is back. Mount Char sounds great - I am going to check that out. I need to read some Stephen King someday. I haven't read any of this fiction works. Thank god for you, Andi! I haven't finished a book in about a month either and I seriously thought there was something horribly wrong with me aside from just having enormous amounts of stress right now, but you make me feel not alone now :p Now I just need to find MY book to get me over the hump, lol. These sound good! Sometimes it's all about getting the right book in your hands! Glad to see you liked Full Dark, No Stars. Not exactly horror (at least not in the way The Shining was horror) but definitely great stories. Or maybe it's a different kind of horror, more realistic.